Toronto's hitting, both early against Porcello and late against the Bull-Pen, was a prime example of why the VMI was created. Toronto was a little out of their element at a minus 5.41 VMI, meaning their hitters' eye would normally be about 3/4 of an inch below the four-seamer. At 93 mph, it becomes a little more like a " -3 something" VMI and only about a 1/2 inch below that pitch. 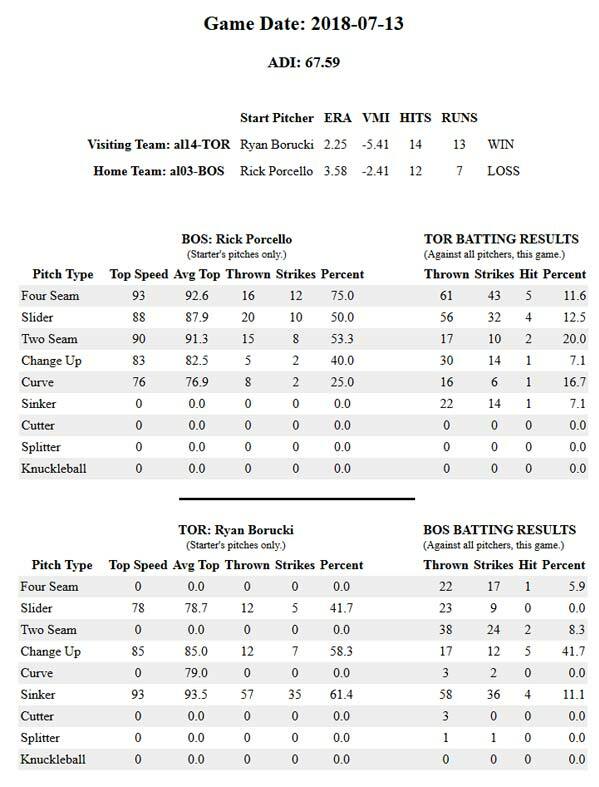 Toronto has seen a lot of pitches by Porcello over the years and their focus would be keen. The ADI was 67.59 yesterday, so the pitches would be moving very well, but the VMI shows what the players are used to, because it is nice for a pitcher to have good movement until the hitters are used to seeing that much. The biggest issue for Porcello was his being a "Reverse Pitcher." He focused on an 88 mph Slider (downward breaking) and the lesser (than 4-seam) lifting 88 mph Two-Seamer. That is a recipe for disaster against a larger minus VMI team. This time it got him pretty good. Borucki threw three types of pitches focusing mainly on the Sinker. Boston hit the 93 mph Sinker quite well as would be expected from a team at -2.41 VMI, so Borucki is a typical "Reverse Pitcher." It is totally understandable that a pitcher who throws an average speed would look for something besides a 4-seamer to throw, but he probably needs to know when to throw what pitch-type. Boston killed the change-up for 5 hits, but hit the 4-seamer opportunities poorly.